We spent the afternoon at the annual book fair of Austin Book Workers (you bet I’ll be joining that group!). 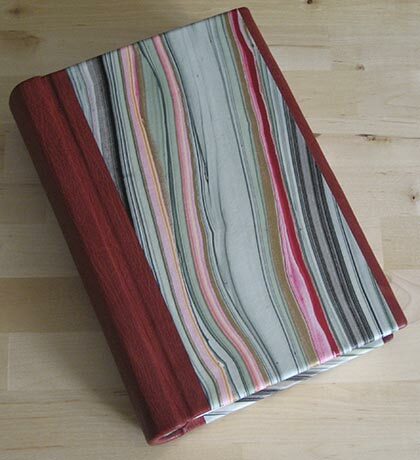 We saw some lovely books and even some demos on paper marbling. My favorite was the suminagashi which I’ve never seen before. Here’s a pic of the demo. After the artist has added the ink in the water, rice paper is laid on the water surface to “pick up” the ink. 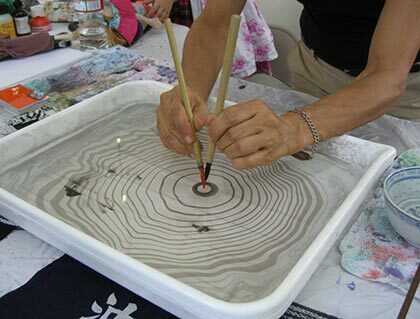 The paper is then set to dry and can be used for calligraphy or any other paper arts. I wish I had a picture of some of the finished results but I was too busy watching this that I forgot to take those pics. This really looks like a lot of fun so maybe one day I’ll have to try it out. Finally, I took a few pictures of my springback book. Remember this book? Well here’s how it turned out. Here’s another picture of the inside so you can see a bit more. Eventually I need to take better pictures of this one to add it to my bookart page. I’m just so excited it’s finished because what with my move, vacation, etc. I almost thought I’d never see the complete version! Definitely an eye-opener to me, Iliana! Your latest book is gorgeous. And the paper marbling sounds like a lot of fun. That is beautiful, Iliana! You are so talented! That’s beautiful. I’m jealous. 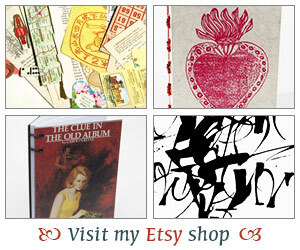 I wanna make beautiful books too! The suminogashi looks fascinating! You are certainly in the right place for creative work right now. I’m still loving the journal you sent! That is just gorgeous! You are so talented. Just seeing these gorgeous creations makes me want to learn! You better not sell this one! Wow, your book is beautiful. I would almost hate to write in it! Your book is GORGEOUS!! I love love love it. bethany canfield – Thank you! I love sharing pics… I just get lazy about taking them. ha,ha. tanabata – I’ve done paper marbling in the past and it is a lot of fun but I’d never seen this which I believe is how originally paper marbling started. It’s so pretty and looks so easy to do but I’m sure it’s not! sassymonkey – you should give a try. Get a good book (I can recommend some if you want) or see if there are any classes around you. 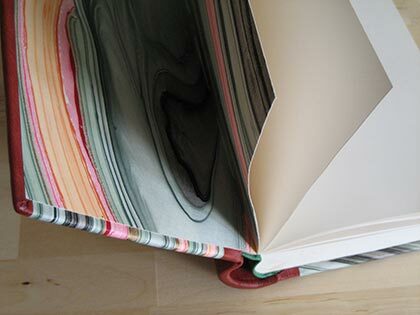 Start off with a simple binding and see if you really like it! jenclair – I definitely think I’m in the right place. Austin is a great place for crafters and artists so I’m pretty excited! Heather – Thank you! Give a try some day! aka Nik – I think this will one remain blank for quite a while. I just can’t think of what to put in it. Oh Iliana! the book is gorgeous! And what a fun day at the book fair! Stefanie – Thank you – I was pretty happy with it. Can’t wait to be part of the Austin Book Workers and learn more! I haven’t seen anything like that in a store. It’s beautiful! I’m so proud of you girl! Your leather bound book looks fantastic. Keep up the good work! What fun! Your book turned out lovely. It’s nice there’s a book group in Austin for you to join! That turned out great! Not only does it make a cool cover but that would be great as endpapers for other books. Well done! Danielle – I’m so excited about finding the group. I was so bummed out about leaving my class in Dallas so this is at least makes up for that somewhat. I’m still going up to Dallas every few weeks to take my class but I’ll probably only do that through the end of Summer. I just have so much more to learn! Carl V. – Those endpapers are beautiful aren’t they? I had had them for such a long time too that I’m so happy I could finally use them. It was hard to work with the paper though as it was super thin and I had to back it up before using it. Your book is absolutely beautiful.